Leaving the Xiling Gorge of Three Gorges and go east of the Yangtze River, you will find Three Travelers' Cave (Sanyou Cave) on the north shore of the river. The cave is 10 kilometers away from City of Yichang. Its great mountains, beautiful rivers, and charming landscape are like a painting. 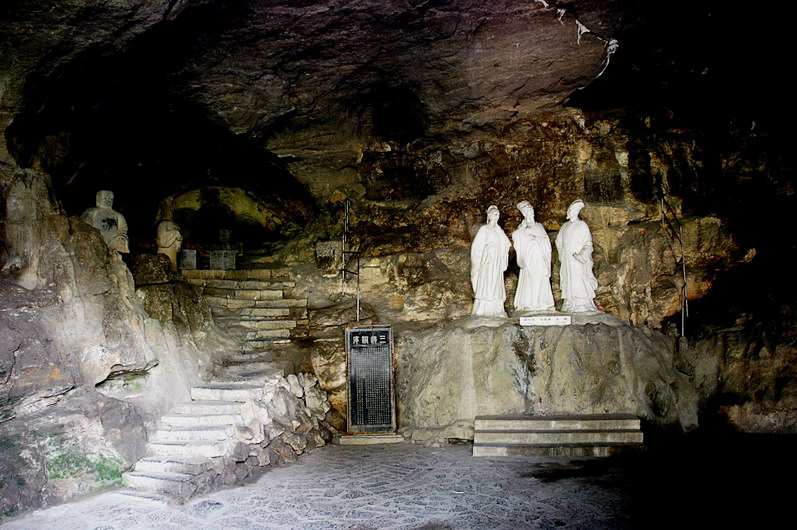 Three Travelers' Cave is located in a deep valley; it is warm in winter and cool in summer with beautiful views. The cave is about 30 meters deep, 23 meters in width and is about 9 meters high. Inside the cave, there are many stalagmites; the three main stalagmites divided the cave into two chambers. The chamber near the front is wide and bright, along the walls there are more than 40 stone tablets. The tablets caved with poems and prose made from the famous poets when they tour this area. 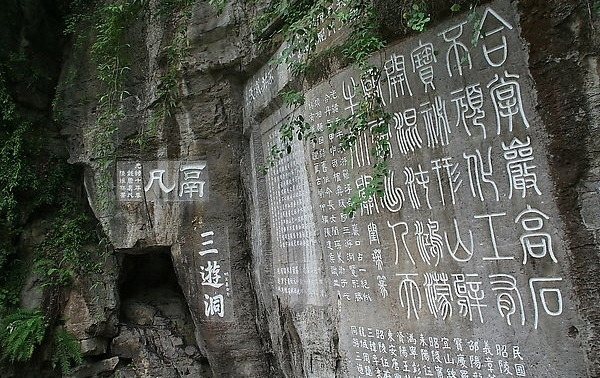 Among them, are the inscriptions of Ou Yangxiu, the greatest writer of Song Dynasty (960 ~ 1279A.D. ), and Bai Juyi, one of the great poet of Tang Dynasty (618 ~ 907A.D.). The other chamber is gloomy and deep with a great many strange stalactites. If you throw a rock at those stalactites, you will hear the echo sound of a bell, yet when the rock falls in to the water you will hear the echo sound of a drum. This is one of the reasons this cave became an attraction. The Yu Spring ('Jade Spring') near Three Travelers' Cave is another scenic spot. Yu Spring is famous for its clear springs and elegant scenery. This spring earned its fame as one of the four finest scenic spots of China. The other three are the Qi Xia Temple of Nanjing, the Lingyan Temple of Mt. Taishan, and the Mt. 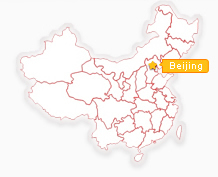 Tiantai. Today, readers can often find the names of those four spots in the ancient poems. If you start your tour from Yichang City, Three Travelers' Cave and Ge Zhou Dam are the scenic spots that you should not miss.